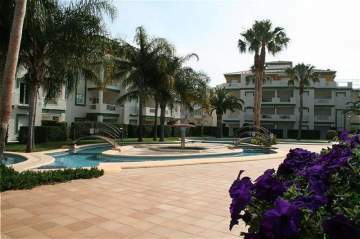 The urbanization is located on the beach road de las Marinas, 2 km from Denia and just 400 meters from the sandy beach. These are ground floor and first floor apartments, with a capacity for a max. of 4 persons. The complex has a garden area and an outdoor swimming pool for adults and children. Free parking in the complex. Nearby (within 500 meters) you will find bars, shops, restaurants and a supermarket. Denia, recognized by the Valencian Community as a natural reserve, is a typical Mediterranean fishing village home to the beautiful white sandy beaches of Las Marinas and the rocky beaches of Las Rotas. The high mountain of Montgó is 800 meters away. It's the highest mountain in Spain and lies close to the sea. You can visit the small archaeological museum or the Baroque church of Santa Maria built in 1734, and the Church of the Assumption. Denia is situated less than 100 km fromAlicante to the south andValencia to the North. This apartment consists of: two bedrooms, one furnished with twin beds, the other with a double bed; a living room with a sofa bed for two people; a kitchenette equipped with a stove, oven, microwave, refrigerator, washing machine and toaster; a bathroom; and a terrace overlooking the garden and pool. During the low season the hours of arrival and departure are flexible and can vary.